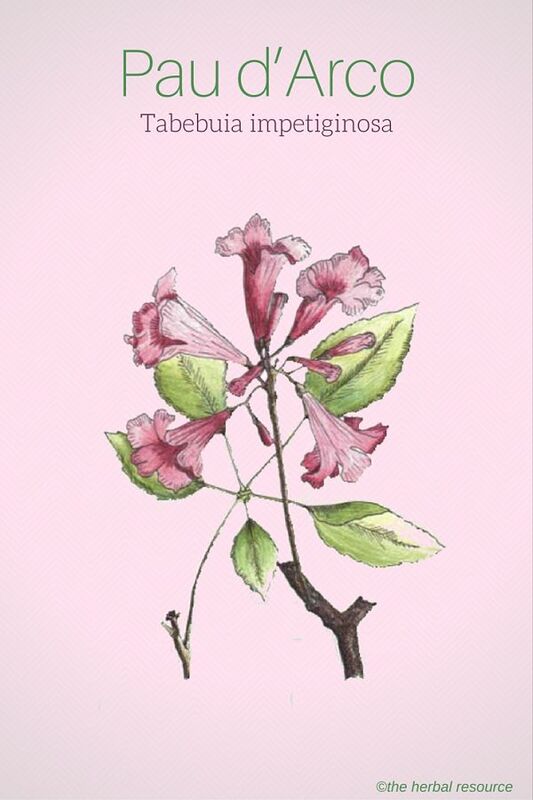 Botanical Name: Tabebuia impetiginosa, Tabebuia avellanedae, Tabelbuia heptaphylla. 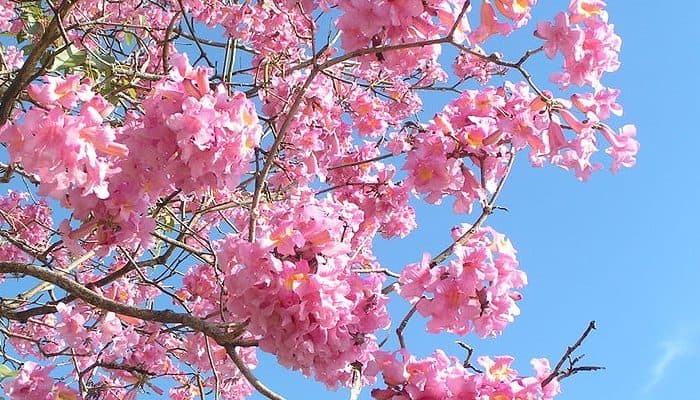 Other Common Names: Tabebuia ipê, ipê, ipê roxo, lapacho, tahuari, taheebo tree, tabebuia avellaneae, trumpet tree, ipê-contra-sarna, tajy. Habitat: Pau d’arco is found throughout the rainforests of Central and South America, although it may be harvested as far north as southern Florida. Plant Description: There are about a hundred species of this large tropical tree. It is a broad-leafed evergreen that may grow to 150 feet in height, and six feet in diameter. Some species produce large, white flowers, while Tebebuia impetiginosa produces purple or pink flowers. Plant Parts Used: Heartwood and bark. Pau d’arco contains alkaloids, quercetin, napthaquinones, anthraquinones, and flavonoids. Lapachol, one of the naphthaquinones, has been found to be effective against malaria and some types of tumor cells in studies with laboratory animals. The heartwood of Tabebuia aqvellaneda contains napthaquinones and significant amounts of quercetin, which are thought to stimulate the immune system, cleanse the body and stimulate the production of red blood cells. Most pau d’arco products are not standardized, and there is considerable variation in the active compounds found in the tree, depending on the species. A number of species of pau d’arco are sold as herbal remedies, which may in part account for the variance in their effectiveness and quality. Most of the research has been done on the wood but at this time little research has been done on the health properties of the bark. Pau d’arco is considered to be analgesic, antioxidant, antiparasitic, antimicrobial, antiviral, astringent, anti-inflammatory, antibacterial, antifungal, and laxative. 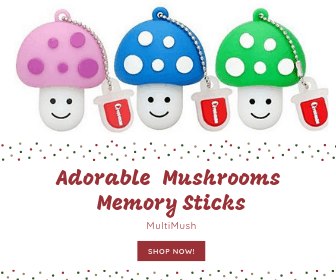 It is thought to have anti-cancerous properties. Pau d’arco has a long history as an important traditional herbal remedy among the ancient Incas and natives of the South American rain forests as a tonic to strengthen the body and improve overall health. Traditional folk healers of the Caribbean use the leaves and bark to treat wounds, backache, toothache, and snakebite. 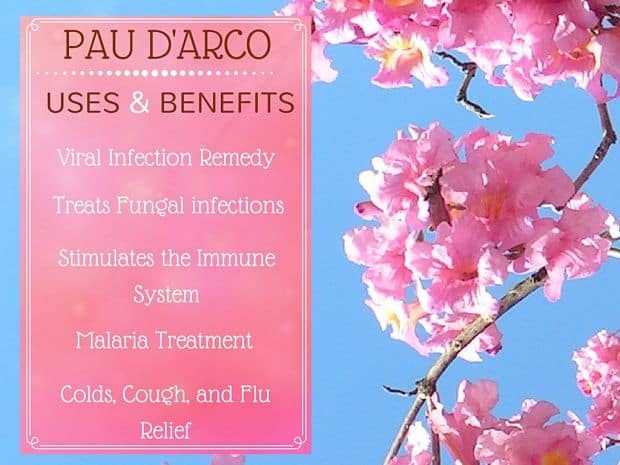 Indigenous people traditionally used pau d’arco as a treatment for malaria, colitis, respiratory problems, colds, cough, flu, fever, cancer, lupus, infectious diseases, inflammation of the prostate gland, sexually transmitted diseases, boils and ulcers. Pau d’arco is used as a natural remedy for high blood pressure, poor circulation, and anemia, and is thought to protect against cardiovascular disease. Tabebuia avellanedae is used as a natural remedy to relieve pain, and as a treatment for arthritis and rheumatism. In the herbal medicine systems of the United States and Europe, the herb has been used as an herbal remedy for psoriasis, liver disease, Hodgkin’s disease, osteomyelitis, Parkinson’s disease, and allergies. Pau d’arco is a popular herbal remedy for yeast infections or candida. A decoction of the herb has also been used as a topical treatment for athlete’s foot, nail fungus and skin fungi. The boiled bark is used as a poultice or wash to treat skin inflammations, fungal infections, hemorrhoids, eczema and wounds. Pau d’arco and its chemical constituents have demonstrated in vitro antiviral properties against, among others, Herpes I and II, influenza, poliovirus, and vesicular stomatitis virus. Capsules: 300 -500 mg three times per day. Tincture (1:5): 0.5 – 1 mL (about 1/8 – ¼ tsp.) two or three times per day. Decoction: Simmer the dried bark or heartwood for at least 8 minutes and drink one-half to one cupful 2-4 times daily. Do not prepare as an infusion/tea (that is, steeped without boiling), as the components do not release easily into water. Pau d’arco is also available as a salve for topical application. At recommended dosages, side effects from pau d’arco are uncommon but may include anemia, nausea, diarrhea, and dizziness. Large amounts of the herb can be toxic and produce some potentially serious side effects. Pregnant and nursing mothers should not take pau d’arco. It should not be given to infants or children. When taken by mouth, pau d’arco can interact with antiplatelet and anticoagulant drugs, aspirin or other blood-thinning medications such as Warfarin (Coumadin), or Clopidogrel (Plavix), leading to an increased risk of bleeding. It may increase the risk of bleeding in those with hemophilia or other clotting disorders. The bark of pau d’arco can sensitize the skin and has caused asthma where people have been exposed to the wood dust. Allergic reactions are also a possibility. Pau d’ Arco is a very good supplement that actually treats various conditions effectively. Follow the dosage and buy quality brands you trust. I had the worst allergic reaction to it in my life. However, I did take too much for 3 days. Pau D’ Arco is a dangerous herb! I tried taking for candida issues and had a severe allergic reaction to it. I took one tea bag/drink in the morning and one at night. I was fine the first couple days and then wham I had aches and pains all over my body plus a fever and flu-like symptoms that lasted over a week. It doesn’t take much for this herb to be toxic.